The ELPH 500HS is an amazing compact digicam, surpassing expectations in image quality and lightning performance. This will be great for anyone with the patience to learn to use the touch screen. Read more in our Full Conclusion. Released in conjunction with the new Powershot ELPH 100 HS and the ELPH 300 HS, Canon's Powershot ELPH 500 HS is their high end model of the ELPH lineup. The ELPH 500 HS sports a 3.2" touch screen LCD as well as a 12.1-Megapixel CMOS sensor for taking pictures. The camera also offers a f/2.0 lens that allows for more natural looking photos and a larger depth of field. Other features of the Powershot EPLH 500 HS are a 4.4x optical zoom with image stabilizer, full 1080p HD video recording with dynamic image stabilization and the HS system that enables the user to take higher quality photos in low-light without the need for a flash. 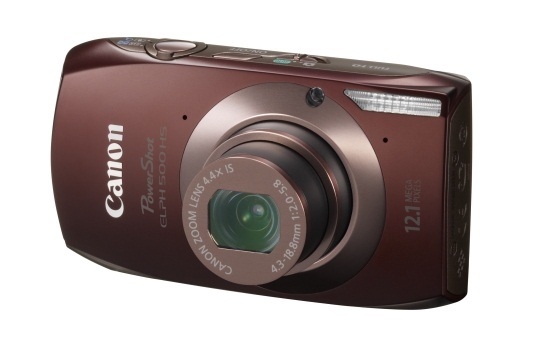 The Canon Powershot ELPH 500 HS is available in three colors, with a suggested retail price of $299.99 US.